Je wilt de beste kandidaat voor de internationale functie. Het selectiegesprek is daarom in het Engels. 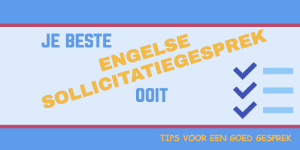 Tips voor een perfect selectiegesprek. Als HR manager heb je een verantwoordelijke taak om de juiste kandidaat te selecteren voor een functie. We hebben een selectie van kant en klare zinnen die je kunt gaan gebruiken. 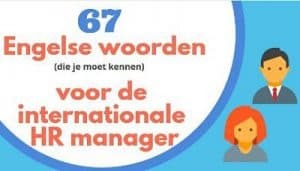 Ken je ook ons artikel met ‘ 67 HR termen voor de HR manager’. Zeker de moeite waard om ook even door te lezen. If there is ‘a vacancy’, there is a job available because a new post has been created or a person might have left. The candidates who apply for the job are also known as the ‘applicants’. When a post/job becomes vacant, the company ‘advertises the post’ in the press or online. We advertised the post in the national press last week and have received lots of applications. Eight people have applied for the job just from advertising it internally. We have your contact details so we will be in touch soon. Although the job was advertised last month, we promoted someone internally. The number of applicants is very high. There are a lot of people with the right qualifications, skills and experience. Our company received letters of application from a wide range of candidates. John’s move to Leeds has created a vacancy in Public relations if you are interested. We don’t have any vacancies at the moment but we will keep your CV on file if you like. We will do a pre-selection of the applicants based on their previous experience in similar companies. This candidate doesn’t have the relevant experience in our sector but he is very well qualified in every other aspect. We use our regular recruitment agency to advertise the post and they do a pre-selection. There are several recruitment agencies who specialize in our sector so we can find highly qualified candidates quickly. If you had enough money to retire, would You? Have you ever had a conflict with someone at work? How did you handle that? What has been your biggest accomplishment/failure so far? What relevant job experience can you bring to this company? What is your greatest weakness/ greatest strength? How do you deal with a difficult manager/colleague? What qualities do you consider necessary for this job? Tell me about a time you’ve made a mistake? Would you be willing to work more than 40 hours a week? How good are you about sticking to your deadlines? A ‘job description’ is drawn up for candidates giving all the relevant information about the job. It is also detailing responsibilities as well as location and salary. A ‘job description’ details all the duties, responsibilities and personal qualities/skills, necessary for the job. Because of the growth of the company, we have written new job descriptions for all the jobs. We are currently writing job descriptions for all new jobs being created in our Project management team. The ‘qualifications’ are the academic and professional diplomas of the applicant. For a post at this level, we consider experience very important. We will give full training. The only qualification necessary is a finished education and diploma. The best candidates are those who have previous experience in the retail industry. 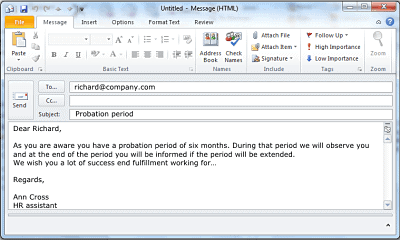 The job offer will also specify a ‘probation period’ at the end of which a new recruit can be dismissed if they are not suitable for the position. They let her go at the end of her probation period. He is still on his probation period. We have another two weeks to make a final decision. Salary and benefits’ are what is paid. This together with the extras the employee will receive in return for the work they do. Although the starting salary is not very high, the benefits include a company car and bonus at the end of the year. We pay very competitive salaries and provide some of the best benefits in the automotive sector. Dear … , We are pleased to announce that you have been successful. We are delighted to tell you that you have got the job. Dear … , We are pleased to inform you that you have been successful. Congratulations. Dear …, We regret to inform you that you haven’t been chosen. It was a different decision we made. Unfortunately you haven’t been chosen. The decision was a difficult one. We will remain your details. On behalf of the company we wish you a lot of success in the future. je hebt nu voldoende tips voor een perfect Engels selectiegesprek. Mocht je graag een professioneel advies over het talenniveau van de mogelijk nieuwe medewerker? Tijdens de selectieprocedure kunnen we een intake doen op basis van het CEF niveau. Dan weet je gelijk of de talenkennis voldoende is voor de functie. Maar misschien wil je ook wel zelf solliciteren op een internationale functie. We schreven eerder een uitgebreid artikel over solliciteren in het Engels.En hoe jij je het beste kunt voorbereiden op een sollicitatie. Heb je in praktijk wel eens een selectiegesprek in het Engels gevoerd dan zijn we benieuwd naar jouw ervaringen. Heb je dat nog nooit gedaan dan is onze HR workshop misschien wel iets voor je. ‘The Complete Guide to Business Emails and Letters’, bekijk de inhoud en referenties. We stellen het op prijs als je dit artikel hieronder met anderen wilt delen. Bedankt daarvoor.